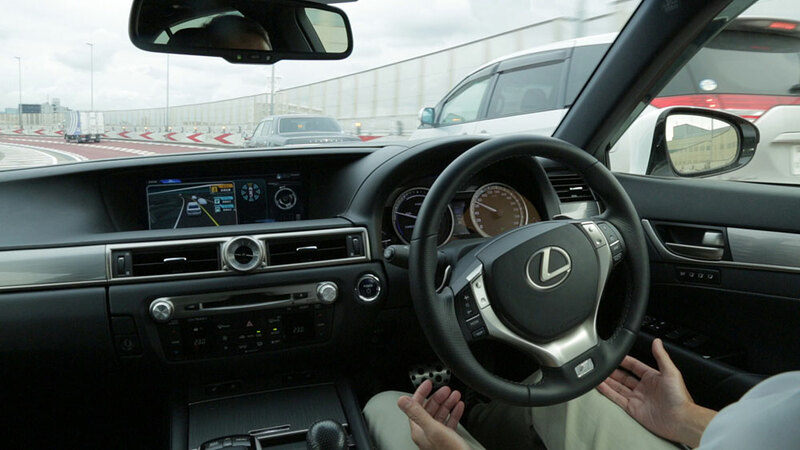 At this point, the modified Lexus concept is only capable of going into autonomous mode on Tokyo expressways. The car can indicate on its center screen as well as play an audio message when it wants the driver to take over if other vehicles aren’t letting it merge. Returning to manual mode is simple — just grab the wheel or press the brake. In the demonstration, a Lexus drove itself within the 60 kpm (37 mph) speed limit for about 10 minutes, changing lanes, braking and steering. The human at the wheel did nothing except turn on a button to kick in the technology. Toyota’s plans are part of a larger Japanese government initiative to pioneer automated driving in time for the 2020 Tokyo Olympics. It also marks a shift for Toyota, which has been working on such technology since the 1990s but with great caution, warning that the idea of a driverless car was unrealistic, even dangerous. The Lexus threads its way through the rush-hour traffic as if it is a shuttle in one of Toyota’s early automatic looms. When there is time to change lanes, the car does that, on its own, no blinker stalk needs to be touched, no driver needs to look over the shoulder and give the all-clear. I always loved to be chauffeured, and I like the idea of being driven by twins, a driver in the flesh, and a computerized clone. When people are at the wheel, I sometimes am scared. Today, I am not worried at all. The human and the robot driver exude confidence, the robot’s driving style is smooth and poised. On-ramp to off-ramp, the human driver could eat, text his girlfriends, or poke his nose. Mannered Japanese he is, he does neither, and he keeps his hands in his lap in a strange yoga pose.